When you’re building a new home, part of the design process is making sure you include all features and amenities that are important to you. Each homeowner is going to have different list of priorities, but having a “must-have” list will help make the process move along smoothly. Here are seven popular “must-haves” that are trending in new home construction today. Convenient Laundry Room – Doing the laundry is never a fun task, but the more dreaded part is putting it all away. Homeowners are now building their homes with laundry rooms on the level that the bedrooms are located. This makes the process of doing laundry and getting it put away easier. There’s no excuse to leaving all your clean laundry folded in the laundry room for months if the laundry room is just down the hall! Open Floor Plans – In older homes, spaces throughout the home are separated by full walls and doorways. 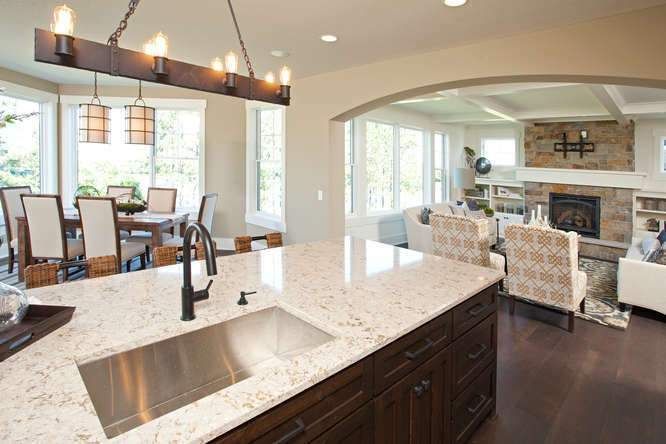 Over the past decade, open floor plans have become increasingly popular. An open floor plan flows from room to room to enhance a family lifestyle. Instead of walls between each room, there are now cased openings or archways to create a smooth transition between spaces. Storage – Homeowners can never have too much storage! Walk-in closets, linen closets, kitchen storage space and walk-in pantries are all giving homeowners the added storage space they need for their belongings and household items. We are even seeing added storage units in garage spaces to keep tools and recreational items organized and out of the way. Family Entrance with “Drop Zone” – In our Minnesota winters, it is important to keep the salt and dirt from getting tracked around the house. A “drop zone”, better known as a mudroom, is the popular solution to this problem. Variations of this space include walk-in coat closets, lockers, or benches with hooks. Designating a spacious area to be able to enter the home and drop shoes, coats, school bags, grocery bags, etc. makes life easier and more organized for everyone. Green Features – Everyone wants to save money wherever they can when investing in building a new home. Homeowners can save substantial amounts of money on their monthly bills by including energy efficient features in your home. Some areas to consider green features include appliances, insulation, windows and insulated garages. Reclaimed Materials – More and more people are becoming aware of their environmental footprint. We are seeing frequent requests to use reclaimed materials such as wood beams, wood flooring, and doors. Reclaimed materials add a unique feature and character to your home. Technology – Technology is a never ending trend in innovation and convenience. With smart phones becoming the norm, homeowners are installing features in their home, that with touch of a button on their cell phones, they can lock their doors, change the home’s temperature, turn on/off lights, and arm/disarm their alarm system. If you are thinking about building a new home, start creating your “must-have” list and be sure to put some thought into some of the trending features. To meet with someone on our team about building your dream home, call 952.322.8700 or email info@homesbytradition.com.